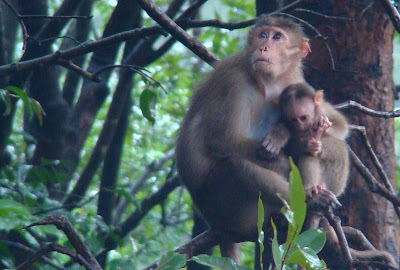 Matheran comes under the Ecologically Sensitive Area, it is a category of conservation areas that is more flexible and open than present day Protected Areas (Wild Life Sanctuaries and National Parks); which face pressures beyond their resilience power and thus are vulnerable to ecological degradation. It does not prohibit livelihoods except from hazardous industries. The Matheran ESA encompasses 214.73 sq. km area, in and around it and 200m buffer zone. More than 60% of Matheran comes under reserved forest category. Before we went Matheran, one of my friends made a detailed plan of places we were to visit. But it is in the law of Murphy; nothing goes as easily as planned. Instead of reaching Matheran at 9, we reached by 11. It was discouraging enough, but we still decided to visit Lords Point and Hart Point. It was a fine view, with south-west monsoon winds carrying moisture-laden clouds to these lands and bathing it in gallons of water – giving a new look to the forests. Matheran is very populated during this season. There is nothing like an “off season”. When it pours, it pours tourists to this place too. People come here to enjoy the rain, the waterfalls and leave behind traces of heaps of garbage. Matheran is an example of failed tourism coordination. The hotels have increased tremendously and randomly as more and more tourists come to this hill station. There is no ban on the use and disposal of plastics. There is no ban on feeding monkeys and lastly no police to patrol the place! The tourism industry of Matheran is shaped haphazardly. It is this that is exerting pressure on the wild flora and fauna of the place. Albeit all of this, Matheran is yet an excellent place for nature enthusiasts – be it flora or fauna. And Monsoon brings out everything if you have an eye for one. I hope it lasts for eternity. It was pouring heavily on the first day, but we had some common sightings. It was in the night that many creatures wandered out – and was the best night trail ever. The next day was fine, except that I was totally burdened by my heavyweight sack! The sightings were scarce, but many of these were top on my wish-list. 2. Unidentified spider – 1 – Theridiidae? Buttresses of a giant tree. It was a massive tree on the side of a wrong path which we took. We are lucky to have such giants stretching out to the skies, still. The buttress roots prevent the tree from falling. Trees growing with shallow roots or poor soil usually show these types of roots. The buttress roots dont bore deep but usually remain well near the surface. A Mushroom that caught our eye. It was bang in the middle of the unused path. Mushrooms are the dead-eaters, like how bacteria help break down animal products, mushrooms are one of the decomposers of dead plant material such as the tree-trunk. Monsoon is the best season to look out for them. They come in various shapes, sizes and colours. Stick Insect - A well camouflaged Stick Insect did not escape our eyes. Stick Insects belong to Phasmatodea Order, They chew onto the food - such as leaves - which distinguish them with the true bugs of Hemiptera that have sucking mouthparts. The eggs of Stick Insects closely resemble seeds, and are capable of waiting for a year before they hatch, depending on the suitable weather. A female stick insect - Phobaeticus serratipes is the longest living insect today. Unidentified Ant - An ant about 15 mm in size, with wings on top was resting on the wall of the hotel. Ants with wings are either fertile male or females - in accurate terms - drone or a queen. They are the pioneers of a new colony. The "winged" ants fly out at of the nest, much like "winged" termites, and wander far off to mate and establish a new colony. However, in some species, the Queens are wingless and Males possess wings - but males are very small compared to the Queens. The Queens can live upto several years while males mate, eat and die early. But things are not so pretty as they seem. There is more than meets the eye. herself prior to development of a colony scent. 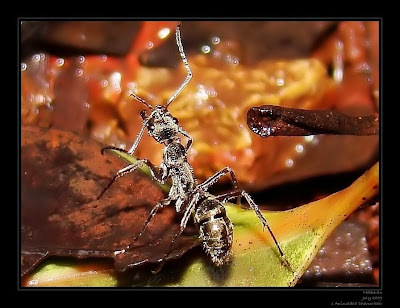 Other species use pheromones to confuse the host ants or to trick them into carrying the parasitic queen into the nest. Some simply fight their way into the nest. A conflict between the sexes of a species is seen in some species of ants with the reproductives apparently competing to produce offspring that are as closely related to them as possible. The most extreme form involves the production of clonal offspring. An extreme of sexual conflict is seen in Wasmannia auropunctata, where the queens produce diploid daughters by thelytokous parthenogenesis and males produce clones by a process where a diploid egg loses its maternal contribution to produce haploid males that are clones of the father." - Wikipedia, for more - http://en.wikipedia.org/wiki/Ant Diacamma (sp. rugosum?) - It is an ant with a golden sheen, the workers of which scout the forest floor singly. 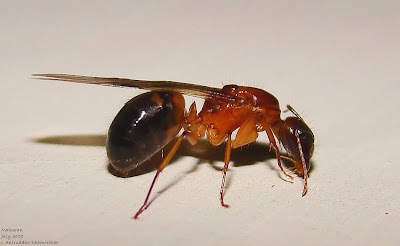 Earlier I spoke about the Queens and Drones, but these specific ants - of the Subfamily Ponerinae - lack a Queen! They have a Queenless ant colony, a lesser known fact in today's academia. Usually, gamergates - female workers who have mated, produce the offsprings. The gamergates will either mate inside the colony, or with an outsider. Lesson to be learnt, the Ant Colony is as complex as a human society. Glowworm - One needs luck to see it, which comes easily in the night than during the day. This glowworm had a glow at it's bottom (the lower right corner is the bottom). Too bad I could not manage any shot without flash to display the glow - thanks to its constant movement and the rain. There are several larva of insects that are commonly called Glowworms, but the Order with many Glowworms is Coleoptera - Beetles. In Coleoptera - two families viz, Lampyridae and Rhagophthalmidae are known from Asia to produce light, in larval or adult stage. 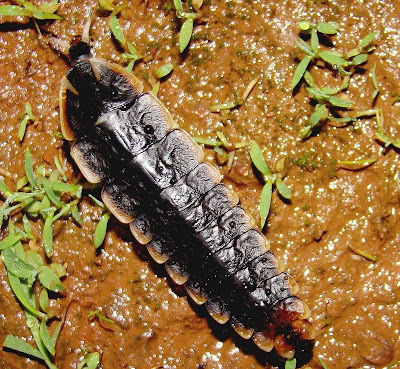 The photograph above is that of a female Firefly that has retained it's larval shape. The females use it to attract males * Needs Citation. The light is is bioluminiescent - produced biologically with the help of a pigment Luciferin. Unidentified Blister Beetle - A beetle belonging to Meliodae - well known for producing a blister-causing pigment. It was with an unusually long neck, seen on the night trail. He was fond of my umbrella and was trying to get on it no-matter-what! He was a curious little creature, probably attracted towards the torch. Or it wanted to bite me?! Unidentified Cat-legged Spider * needs citation - Of the Theraphosidae family, the infamous "Tarantulas" are healthily present at Matheran. Stumbling upon one on the path at night is probable than finding one in the day. It is a big spider, and a primitive one at that. Tarantula is a term coined abroad, literally meaning "Bird-eating-spider, and it is usually referred to as the same in India too. 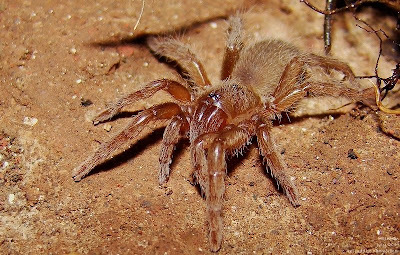 There are 49 endemic species of Tarantulas in India. They have small eyes, situated on top of the prosoma (Cephalothorax), just above the chelicerae (fangs). They dont have a good vision, and can only distinguish between light and darkness. The greatest sense is the sense of touch - thanks to those hairy legs - the Cat-legged Spider can detect vibrations on ground and in air. These spiders pose no threat to humans in any way - unless you agitate them, however their bite does not kill a person. This baby Tarantula, a spiderling was seen taking shelter in an abandoned home during heavy downpour at daytime. it was hardly an inch and very cute! Here is another Tarantula picture (above) showing the hairy abdomen. Why was I so eager to see the baby's bum? 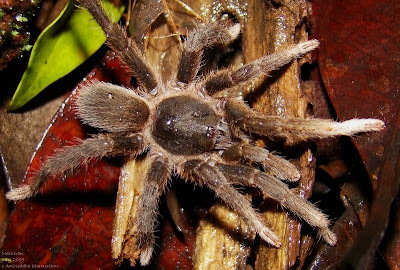 Well, tarantulas, when agitated, rub their hind limbs against the abdomen, releasing these hairs. These hair when enter the nose cause a lot of irritation, and if by chance pierce the skin - an allergic reaction. The hair are extremely small so getting them off is impossible. Cob-web Spider - The name "cob-web spider" is a misnomer, this spider most probably belongs to Theridiidae Family, they are very common yet lesser known, small and ugly looking spiders that make up untidy webs. They prefer dark corners and are also seen inside houses. But dont underestimate them for they are the ones who help in keeping mosquito and fly population in check! The spider photographed was about 40 mm in length. Theridiidae family is well known because of the Black Widow Spider which is considered clinically significant. The bite of this spider does have a serious allergic reaction. However, the photographed species is not identified and is probably not dangerous. 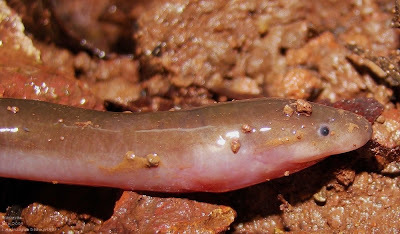 Synbranchidae Eel - An interesting find without upturning the stones, this Eel first startled us - it was a Caecilian for us until Andrew Arunabha Rao, an expert, wrote me regarding the true identity of this elusive creature. "Two days back you posted a pic of a caecilian type which you shot at Matheran. This is actually an Eel of the genus Monopterus or Amphipnous. Basically, there are two types in the Western Ghats : Monopterus fossorius & Monopterus indicus. The former the rarer of the two is reported from Thiruvanathapuram, Kerala, standard length : 23 cm and the latter from Robber's cave, Mahableshwar, Maharashtra, standard length 8.5 cm. The status for both species is RARE. The photo taken by you is of a Monopterus or an Amphipnous. These two groups although recently lumped together, are very distinct and deserved to be recognised at the generic level or even higher. Each of them has subterranean as well as surface-dwelling species like Monopterus albus, Amphipnous cuchia which grow pretty large upto 90 cm or more and often find themselves being sought after as 'medicine' food. Thought to do wonders for blood ailments. The specimen seen in the photo could very well be a subterranean species. At this moment I cannot tell whether it is an undescribed species. The first things is to find out whether it is a Monopterus or an Amphipnous. Amphipnous invariably has small, more or less regularly overlapping scales, while Monopterus are always without scales. In Amphipnous cuchia the entire body is covered with scales. In subterranean forms usually only the posterior part of the body -- but usually as far forward as the vent -- is covered with scales." These scaleless "fishes" live most of their life underground, and hence very less is known about them such as their feeding behaviour, breeding, offsprings and even their distribution. Ramanella sp. 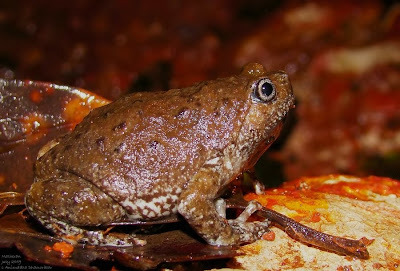 - A cute little frog, Ramanella is a genus of Microhylidae they are commonly seen in rainwater ponds, croaking in the night. They have characteristic discs on their fingers but lack it on their toes. The above picture shows one in an ankle deep puddle, croaking. The below picture is of the one seen on the path. They tend to swell up if touched (as in the picture below), or press flat against the ground. Philautus sp. 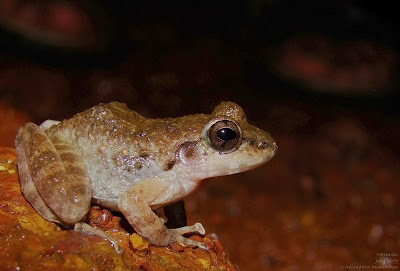 - Commonly called Bush Frog or Shrub Frog, they are abundant at Matheran and will make their presence felt on the path. Their constant croaking and superfast vanishing (jumping, really) makes one run for their money! An interesting note on Wikipedia - This genus is unique in that there is direct development, with all growth inside the egg and no free swimming tadpole stage. Some species have been found to bury their eggs in soil although they are arboreal and others attach their eggs to leaves. Duttaphytnus melanostictus - A very common toad all around the country side. Very rare in cities now. It was once so common at my residence, now there are no toads surviving here, forget frogs. It is another common fellow to come onto the path at Matheran. Using torch at night is very important you are likely to step on one. Banded Ground Gecko: Geckoella sp. (deccanensis?) - A treat to the eyes, this beautiful ground gecko rushed on the path through my feet. I first thought it to be the toad, but a glance of it running into the thicket left me mezmerized. We are well accustomed to geckos in our houses and gardens, those dull coloured, easily camouflaged fellows everyone dislikes. This gecko sure took my breath away! This beautiful lizard was an icing on the cake. A first timer for me. They are nocturnal and hunt on the ground - hence the name. They are quick and good hunters. Green Vine Snake: Ahaetulla nasuta - A common resident of Matheran, yet so uncommon that only keen and trained eyes can spot it. A beautiful snake, it is also commonly referred to as Whip Snake. It is semi-venomous, meaning it causes a mild allergic reaction if bitten. They are arboreal but will use ground to go onto an unreachable tree. Their main diet is frogs, lizards and insects - some are also recorded eating other snakes and small birds. The above picture was taken during a night trail, in a dense bush. It was foggy and raining. 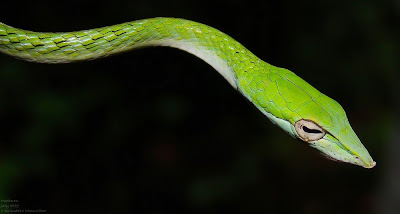 The above picture is that of another Vine snake seen on the second day trail. It was raining and this guy was sitting motionless just besides the path. It had this waterdrop hanging from it's snout... so beautiful! The above image is of a cute little Vine Snake, barely measuring 30 cms. It was small and aggressive yet very adorable - cutest Vine Snake I've ever seen! 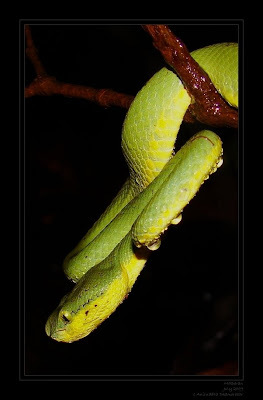 Bamboo Pit Viper: Trimeresurus gramineus - Another beautiful reptile of Matheran, the Bamboo Pit Viper is a venomous viper seen in Southern India. It is a creature known for patience and ambush. They lie in wait just above ground level for a passing prey such as a lizard, frog or a bird and strike with lightening speed. It measured approximately 35 - 40 cm. The above image was taken in its natural, undisturbed pose. 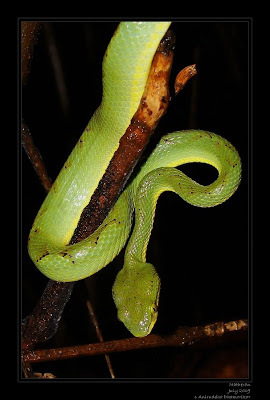 A side-view of the Bamboo Pit Viper lying in wait for food. This was another fellow seen just besides the path, lying in wait of a passing prey. Here you can see the "turns" on it's body, and how the forked branch is holding its weight. He will lie like for for several hours! It measured approximately 30 cm. The above image was taken in a natural, undisturbed pose. Another image of the Bamboo Pit Viper, after it sensed us around, he started changing the path and going upwards. It is not an aggressive snake, but can bite if agitated. The above is the last image of a pit viper - known for it's heat-sensing pits. Those two holes just below the eyes are the heat-sensing pits. 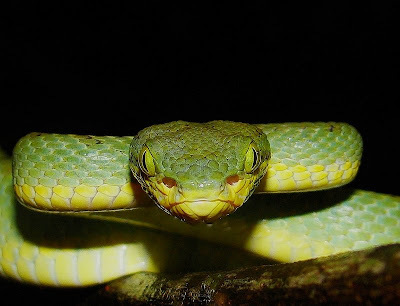 The vision of Bamboo Pit Vipers is not so good, so they depend on a "third eye" and that's those pits. They make the snake see a "thermal image" of either a cold or a warm object. Just adjacent and a little below the heat sensing pits are the nostrils unlike us, snakes "smell" through their forked tongue. Those eyes are typical of a nocturnal hunter, but it's those pits that set this extreme predator apart from others. Amazing creature! Bonnet Macaque: Macaca radiata - The menance of Matheran, they can, however, be subtle and loving. We observed this mother and child for a long time as we sipped our chai. Many tourists also noticed them and took their pictures. It was her restless kid. In this photograph, she was seeing her other troop members while her kid was busy playing with himself. Adorable monkeys! The last image shows the back size of the Bazaar (just before u hit the main Bazaar) taken on the way while going Garbet Point. The tiny white dots on the cliff are garbage - plastics and everything else. So if you ever wonder where they dump your waste plastics you left in your hotel room, it's down there in the valley. It was a revelation so bare and sad. hello, it was wonderful to go through ur blog. wonderful pictures of insects and reptiles, i like them alot, thanks for posting it. i admire ur skills. Brilliant snaps!You have a great camera and fantastic skills. Brilliant Post and great snaps, buddy. Just a small correction. Third paragraph : "Ecologically Sensitive Are" and not "economic". Seems like a slip of pen. Though it means the same in the long run! Thank you for bringing it to my notice Shree kumar, it is quite an embarrassing slip of hand! 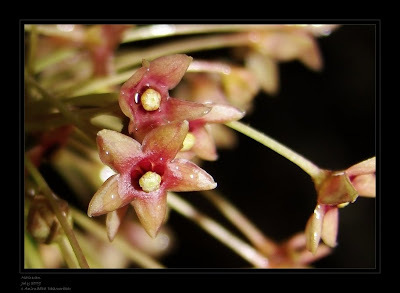 Good post with nice photos. Matheran is good place for spending your weekends. There are many places to see in matheran . All these points are main attraction of tourist. Plan your next weekends at Matheran for getting relaxed from daily routines.